Last week I wrote about the importance of incorporating relaxation into your daily routine. I mentioned meditation as one practice that can bring relaxation and renewal into ones’ life, and I thought I’d spend a bit more time on meditation in this post. Meditation is very helpful to my clients that struggle with a variety of concerns ranging from anxiety, to basic life dissatisfaction, to struggles with relationships. I see meditation as both a life practice, and as a tool to increase therapy’s effectiveness by improving one’s awareness. For example, meditation is useful when one is trying to identify a feeling and locate it in their body, or when one is trying to keep themselves from pushing feelings down and away. It allows people to give their feelings compassionate attention so they can feel better. It also helps them become aware of how they’re feeling throughout the day outside of meditation time. The biggest obstacle to meditation I’ve seen is a common belief that meditation requires special skills. People are always telling me they’ve tried meditation but can’t do it right. They, like so many others, have a misconception that meditation is only successful when one can silence their mind and rest in emptiness. I envy people who can do that, but if that were the only way to be successful at meditation I would have quit a long time ago. My mind is very active and I find it very difficult to tame. I know, however, that the practice of meditation builds my awareness, and that’s a process. My mind wanders a great deal but I know that the more I practice, the more present I am to my life. Sit comfortably, with your back straight and your eyes closed or slightly open and looking down. If you can sit on the floor with a meditation cushion that’s great, but it’s ok to sit in a chair if you need the back support. Notice your breath entering and leaving through your nose. If you’re congested you can breathe through your mouth but breathing through the nose will feel less forced. Try to hold your focus on your breath. Your mind will likely wander, but when it does, just notice that and bring your attention back to your breath. If you notice discomfort, place your attention on the part of your body that is uncomfortable and keep breathing. If you feel emotions rising and falling, just notice them. Attend to any uncomfortable feeling until it passes if you can. Continue for at least 10-15 minutes and try to go longer with each session. Don’t give up if your mind wanders a lot. Even with a lot of wandering you’ll begin to notice your thoughts and feelings throughout the day more readily over time. Summer’s here, and the pressure is on to RELAX! You can see the irony in that sentence right away. Summer is a time when people expect to be able to kick back, take off their shoes, and just enjoy themselves. Yet how often do we actually do that? We might be lucky enough to get some time off to go out of town on a nice vacation. But even then, a lot of people report that they spend so much time planning and fretting over the vacation, that it almost doesn’t seem worth it once the actual vacation finally comes. So how do we find the time to relax in this high-pressured world? The attached article contends that the most common excuse for not relaxing is “I don’t have the time”. That sounds exactly right to me. We’re so busy with our to do lists, trying to figure out how to cram all the things we need to do at home or with our families into the few hours we have each week when we’re not at work that we never actually take the time to relax. I like this article because it gives you ideas on how to relax that almost anyone can find time for. I especially love the idea that when you can’t take a “real” vacation you can take a mental and emotional vacation where you commit to getting away from negative thinking and stress for a few minutes each day just by taking a walk or a bath, for example. A simple meditation or listening to calming music can also refresh you and take you away from the stresses of everyday life. Take a look at the article and see what works for you. Then make sure to find a few minutes every day to implement some of these tools. If you’re chronically stressed and/or running around all the time I think you’ll find it’ll make everything else start to feel a little easier to manage. WHEN IS THE RIGHT TIME TO SEEK HELP FROM A COUNSELOR? The attached article provides a nice framework for those deciding whether to seek help or not. There are very few articles out there about when it’s the right time to seek help, so it’s a nice addition. The decision to seek counseling or therapy is difficult because one is deciding whether to make themselves vulnerable to a stranger or not. For this reason, as well as the high cost of therapy and anxiety about what is going to happen in counseling, a lot of people put it off and hope that their problems will resolve themselves. And sometimes they do, but often they don’t. Also, many people have had bad experiences with therapy in the past and don’t want to invest their time and money again on a on a risky venture. So, they wait until they’ve run out of options before making that leap of faith again. I understand all these concerns very well. They’re why I started Compatible Counseling Solutions in the first place. I hate to see people make themselves vulnerable to someone that’s not going to help them, and I’ve seen it happen time and again. If you are at the point where you’re wondering if now is the time, I urge you to read the attached article and see if any of the scenarios that are described fit you. If you’re not sure of exactly what you need I hope you’ll consider contacting me. I can help you sort through whether, and what kind of counseling will be most helpful to you and I can help you find an effective therapist that meets your needs and maintains a focus on your goals without keeping you in services indefinitely. 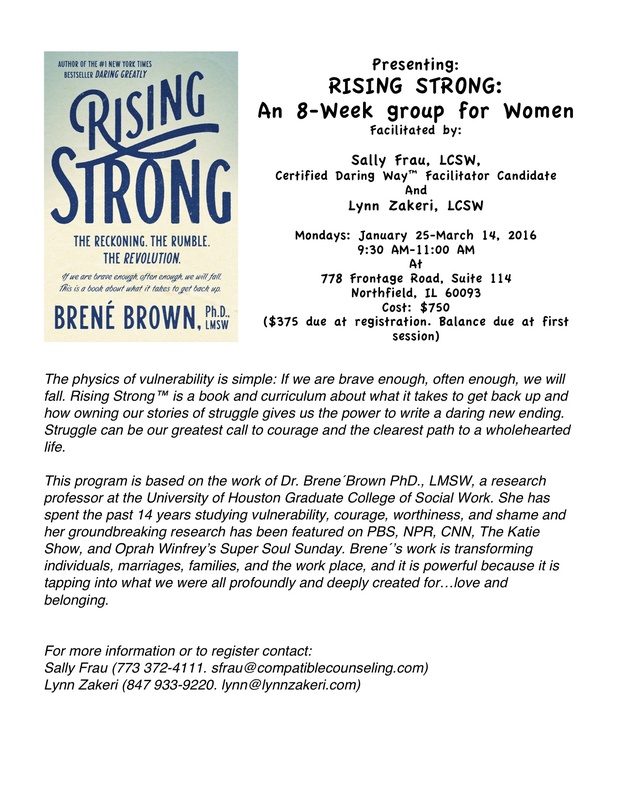 Last week I began publicizing my upcoming Rising Strong™ group for women (see attached flyer at end of post). I want to say a few words about this new curriculum since many people do not yet know what it is. 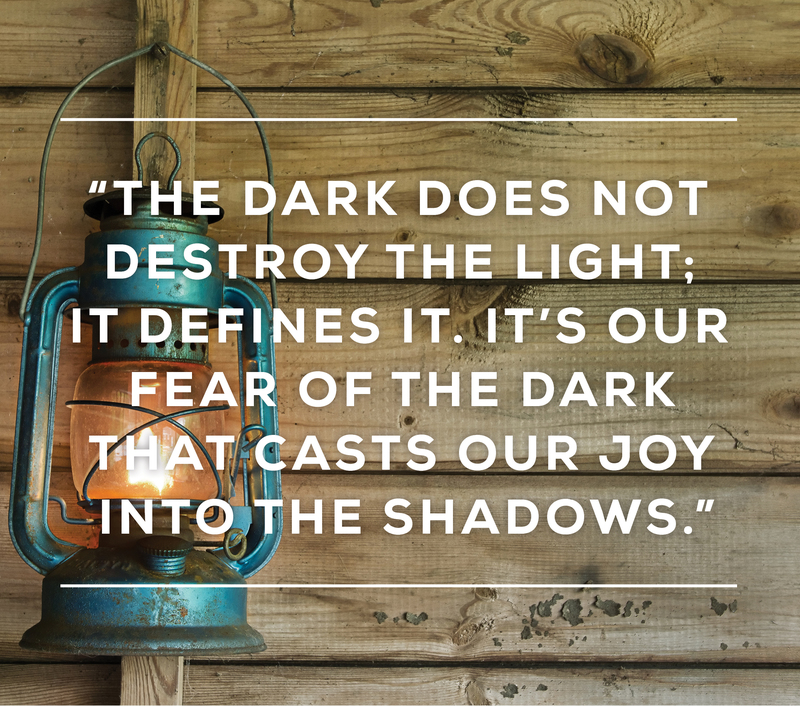 Brene´Brown released the book Rising Strong™ in August 2015. It is the latest in her series about creating a courage practice for your life based on development of shame resilience and increased willingness to be vulnerable in one’s life. As a Certified Daring Way™ Facilitator-Candidate I received an advance copy of the book with the expectation that I would ultimately be trained in the material and integrate it into my work with individuals and groups. After having enthusiastically read Brene´’s previous three books I admit to having been a bit wary of this one. After all, how much new material can she have on shame resilience? I thought to myself that this was going to be the one where she starts repackaging and rehashing everything we already know about vulnerability and shame, and I was going to be disappointed and bored. I am here today to say how wrong I was. I am super enthusiastic about the book and about my upcoming group in January. Rising Strong™ really does take off where The Daring Way™ left off. Both books use the analogy of Teddy Roosevelt’s “arena” to describe how we show up and be seen in our lives. In the case of The Daring Way™ we learn the tools we need to enter the arena, knowing that we’re at risk of getting hurt. 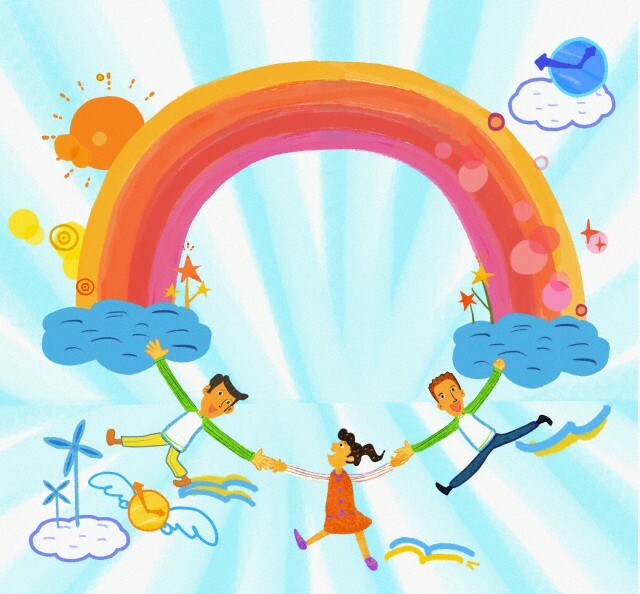 In a nutshell The Daring Way™ teaches us the importance of having trusted friends we can count on, and how important empathy and self-compassion are when we’re going into a situation with no guarantees. The curriculum teaches us to remove our armor and let ourselves be seen, and helps us understand how to recognized shame and what our shame triggers are. Rising Strong™ specifically addresses what we can do when we’ve already gone into the arena and have fallen. How do we get curious about our emotions when we’re feeling hurt? How do we understand and question the stories we tell ourselves about what happened so that we can really rumble with the underlying hurts? And how do we write a new ending to our stories that allows us to move past the hurt and try again? As you can tell by my choice of words, Rising Strong™ is all about story. 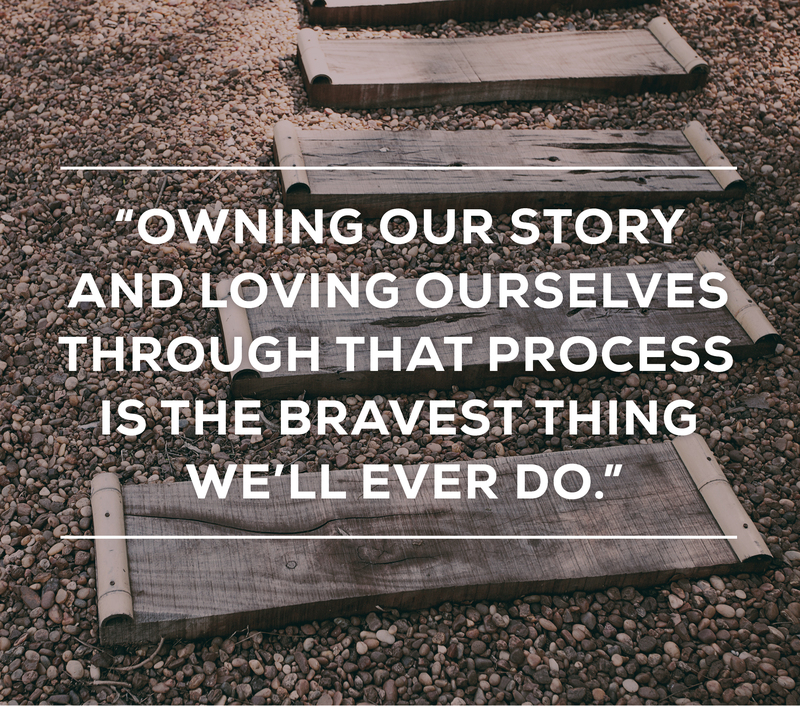 It’s about the stories we tell ourselves when we fall, the ways we act out those stories by offloading hurt, and is about finding a more accurate ending that keeps us aligned with our authenticity. Using the idea of story to address hard issues such as grief and forgiveness, anxiety, criticism, and trust allows us to really dig in and access hard material that would be a lot harder using a different format. I hope this answers a few of the questions that have come up about the curriculum. My flyer for the upcoming group is attached to this post, along with contact information if you’d like to know more. I look forward to Rising Strong with many of you in the coming months. It’s been a little over a week now since the clocks changed back, and I find myself mourning the loss of the light of day and the warmth of the sun. This is always I tough time for me and I think it is for a lot of other people too. It’s a time when we pull back and reflect on the past year and then try to think forward to what’s next. But forward thinking can be tough at this time of year, as many of us get stuck on thinking more about what was than on what could be. So, with that in mind, I decided to do a little scavenging for articles on happiness. The one I’m attaching here is very simple – it refers to 10 studies on happiness, several of which debunk a couple myths of happiness (that money and possessions bring happiness), and a few others that are reflective of the simple practices that can help us maintain our connection to basic happiness and connection. Maintain a simple gratitude practice to increase overall happiness (note at least 3 things each day that you are grateful for – they should be mostly different things each day). Hug the people you love. Increased levels of oxytocin are associated with happiness and can be achieved simply through eight hugs a day. Think positive thoughts and smile. Smiling as a result of thinking positive thoughts improves mood. When we place our thoughts on the positive we feel more positively. Surround yourself with happy and joyful people. Happiness is contagious. Engage in acts of kindness. It helps others feel good, and rebounds to help you feel good too. One simple compliment each day or a simple random act of kindness works wonders. Exercise. People who exercise on workdays are happier and have less stress in their lives. Really, if you make sure you move every day you will feel better. Volunteer. Volunteering results in improved mental health overall and decreased feelings of depression. Give generously. Generosity promotes happiness. Whenever you can spend more on others than you do on yourself. As you can see these are very simple and basic practices. One needs only to decide to try them out to see that they begin to work almost immediately and make these dark days of fall and winter a little easier to bear. I couldn’t resist reviewing and commenting on the attached article by Kristin Neff. 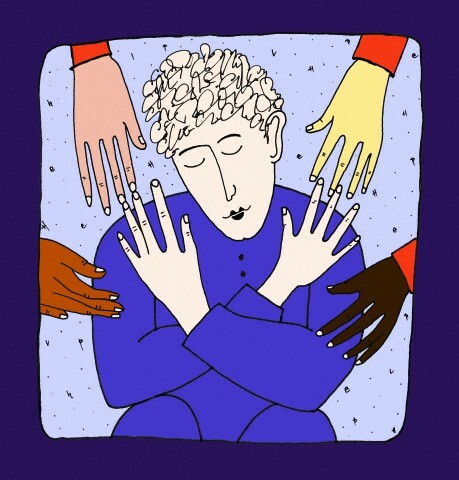 Her work on self-compassion is integral to The Daring Way™, Brene´Brown’s shame resilience and vulnerability curriculum that I facilitate with individuals and groups. 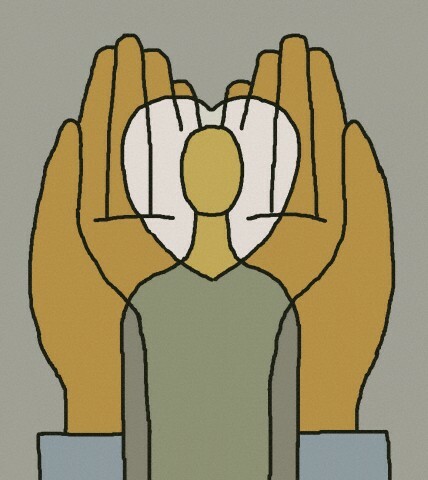 Self-compassion is an essential component of the Daring Way™ model. It’s seen, not as an attribute that people either do or don’t possess, but as a practice that we have to cultivate over time. In the Daring Way™ we talk about how if you’re going to show up and be seen at vulnerable moments you must be able to practice self-kindness and recognize that when we screw up we’re not alone – everyone screws up sometimes. We have to be willing to take risks, screw up, getting back up, and try again. Without a little self-compassion it’s tough to get up and try again. In this article Kristin Neff describes five myths about self-compassion that make it hard for us to practice self-kindness: 1) Self compassion is a form of self-pity, 2) self-compassion means weakness, 3) self-compassion makes one complacent, 4) self-compassion is narcissistic, and 5) self-compassion is selfish. These five myths tend to be compelling because they’re reflective of our dominant cultural beliefs that in order to be a good person we have to be really hard on ourselves. I recently came across the attached article on therapeutic ethics. This article was particularly compelling to me because it talks about how to provide a safe and contained environment for therapy to take place. Providing a safe environment is vitally important to helping our clients develop the trust necessary to succeed in therapy. Yet how many of us have operationalized safety and really gone out of our way to ensure that we have really clear boundaries and rules in place to ensure that clients can feel safe. As the clients and therapists I work with know, I search through Therapist Directory profiles as a first step in bringing therapists into my network. I look for profiles in which the therapist describes what they do with clients and how they do it. If they can describe their work I know that this is probably someone who is well trained and has theory behind their practice. About 80% of the profiles that I read, however, talk exclusively about safety, and maintain that the reason people should come to see them is that they provide a safe and trusting environment. Most of these profiles say little else, and I can honestly say I bypass every one of them. To me, providing safety is so fundamental and obvious that if that’s all that a therapist has to say about what they do, I figure they’re not doing much with their clients beyond sitting and listening to them. And I think it’s also likely that if I called most of these therapists and asked them what they do to provide safety and a trusting environment they wouldn’t be able to tell me. I’m pleased to see this article in which the author describes in great detail all of the ways that she ensures safety and clear boundaries with clients. 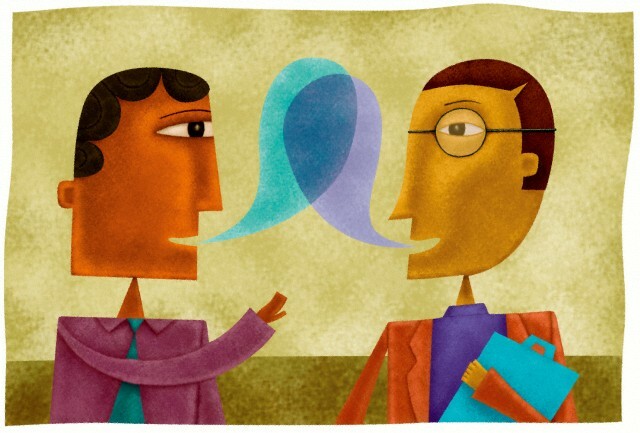 This includes a pointed dialogue with every client about what the boundaries are, how a therapeutic relationship is different from a social one, how the therapist might behave in session, when and how physical touch can or won’t occur, what silences mean, and a discussion about how the therapist and client should behave if they meet outside of the therapy session. And while I don’t share the same therapeutic stance as this therapist on whether it is ever appropriate to share personal information, I appreciate so much that her position is consistent and well thought out from a consideration of what is ethical and in the best interests of her clients. This is what matters the most. For several weeks I’ve been reviewing articles, looking for a good place to resume writing pieces that will reflect all aspects of my practice, including my assessment and referral service, my work with clients undergoing life transitions, and my work using Brene´Brown’s, The Daring Way™. I chose this article (see link below), The ‘Rules’ of Psychotherapy, because it reminds me of a couple of things; 1) that there is no ‘one size fits all’ way of doing therapy, and 2) that as humans we’re hard-wired for connection, and develop trust and authenticity through moments of mutual connection. The article makes a case for how therapist self-disclosure can open up trust in clients who are disinclined to engage with therapists that only provide reflection in the service of developing insight. I admittedly work with several therapists who adhere to this principle. Although this is not my style, I work them because know that many clients want, expect, and benefit from a clean and clear therapeutic environment. The therapists I work with who hold to this position work from theory, know what they’re doing and why, and they are very good at it. My problem with the general neutrality stance, however, is that it’s often assumed to be the only acceptable stance in psychotherapy. Traditionally it’s considered ‘wrong’ for a therapist to self-disclose in sessions. I have written several other pieces on this subject in the past, because I so completely disagree with this line of thinking. I believe that what’s most important is for the therapist know when and how to self-disclose and to do so in the service of helping clients, rather than to get their own needs met. I love the attached article because it uses a case example to explore this issue. The client in the article had always been the one who provided reflection in her relationships. What she lacked was a feeling of genuine connection with another person. At first the therapist refused to allow herself to be seen by the client, and in doing so negated the opportunity for an experience of connection that this client badly needed. Once the therapist lowered the veil of neutrality the client began to make progress. The other day I posted my flyer, (which I have again attached at the end of this post), for my upcoming Daring Way™ group for young, college-aged women. I’m excited to be able to provide the Daring Way curriculum to this population who are going out into the world for the first time, without parents at their heels, and jumping into life without boundaries. If ever there was a group of people that could benefit from a Courage-Practice it’s young adults that have been launched from high school into whatever comes next. With that in mind I thought it might be helpful to talk a little more about why this type of group is so powerful. It provides a common experience that teaches the members to recognize and name shame, vulnerability, authenticity, belonging and worthiness at the time when they are feeling most exposed. It gives them a supportive network that is experiencing the same things as them, so that they know they’re never alone. It provides tools to help them recognize shame and walk through it to the other side where they will find connection and belonging. It focuses on values and helps group members to name what values are most important to them, so that they can use their values to light the way to authenticity and recognize when they are stepping away from their values. These are just a few of the things that participants in the Daring Way™ for Young Adults group will learn and experience together. Oftentimes, participants in Daring Way™ groups form lasting bonds and develop ongoing connections after the group has ended which can be an invaluable resource to them in the months and years to come. 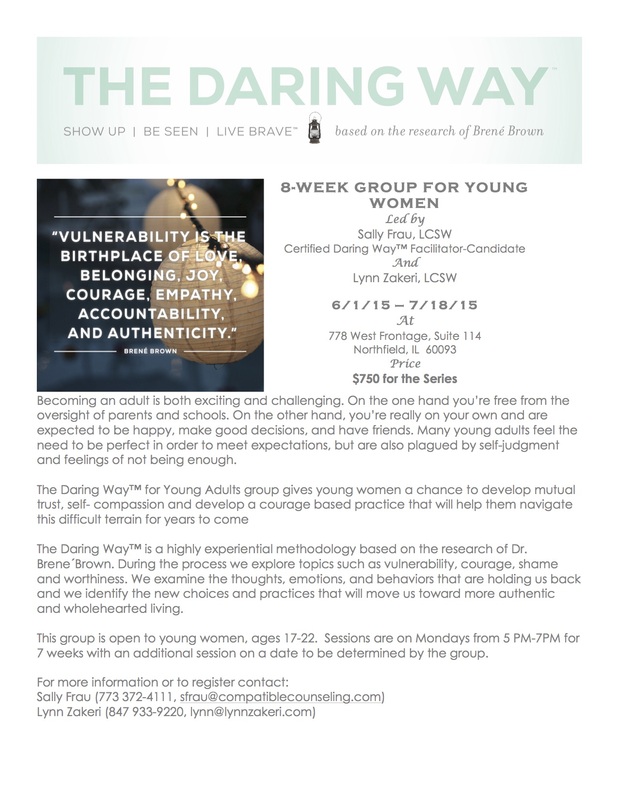 To save your place in the upcoming Daring Way™ for young adults group, contact me, or my colleague, Lynn Zakeri, per the attached flyer. I’ve been getting a lot of questions lately about what I’ve been doing and about the future of Compatible Counseling Solutions. Admittedly, it’s been a long time since I’ve written a post. This is largely due to some outside work I engaged in during 2013-2014 helping manage behavioral health programs in my former agency, a temporary engagement that took much of my time. During that time also, however, I also participated in The Daring Way™ National Training, a 5-day intensive training in which I learned the contents of the new Daring Way™ curriculum and became a Certified Daring Way™ Facilitator-Candidate. It was a wonderful opportunity in which I was honored to meet program developer, Dr. Brene´Brown and learn from her senior faculty how to implement the curriculum for use with both individuals and groups. The Daring Way™ it is a highly experiential methodology that explores topics such as vulnerability, courage, shame, and worthiness. It examines the thoughts, emotions, and behaviors that are holding us back and helps participants to explore the new choices and practices that will move them toward more authentic and wholehearted living. Click on the link to view Brene´Brown’s groundbreaking 2010 TEDx Houston Talk, “The Power of Vulnerability”. The Power of Vulnerability is one of the top ten most viewed TED talks in the world, with over 14 million viewers.